12.04.2017. Georgia’s most important grape variety saperavi is slowly making its way into Australian vineyards. But how do these young wines compare with their traditional counterparts? Saperavi is a deep, darkly coloured red grape variety that is one of 525 indigenous varieties from Georgia (the country), formerly part of the Soviet Union. Saperavi literally means ‘dye’ or ‘paint’. It is one of the very few wine grapes that has red flesh, as almost all red grape varieties have clear flesh, with the wine’s colour coming wholly from the skins. Saperavi is the single most important grape variety in Georgia, in the same way as malbec in Argentina and shiraz in Australia. However, up until now this variety has been almost unknown to Australian wine drinkers. Only recently has it started being grown here by a few innovative winemakers, while at the same time imported wines have started arriving from Georgia. Georgia is located on the edge of the Black Sea and has Russia, Turkey, Armenia and Azerbaijan as its neighbours (some ‘peaceful’ neighbourhood to be in, huh?!). Georgia has a population of 4.5 million, which is roughly the same as that of Sydney. It is widely considered to be the cradle of wine, as it’s proven that they have been making wine for more than 8000 years. It is a very different wine scene to ours, and most other countries, in that a very large proportion of Georgians make their own wine at home. Almost all farmers have at least a few rows of vines and city dwellers visit to buy grapes to make their own wine at home. City folks with gardens tend to grow at least some of their own grapes to make their wine. As a result of this, there are not very many ‘proper’ wineries in Georgia, a few Soviet-era industrial winemakers, and more recently, a rising number of small boutique wineries. Much of Georgia’s wine is made in qvervi – clay amphora used to make the original ‘natural’ wine. The qvervi is lined with beeswax before the grapes are put in, then it is sealed and left to ferment using natural yeasts. The following spring, the wine is syphoned out, the lees are scooped out and the qvervi is cleaned with spring water so as to be ready for making the next vintage. There are no additives, chemicals or oak used, and there is no filtration – what could be more natural than that? In Georgia, saperavi is used not only to make dry red wines, but also semi-sweet and sweet red wines, which were at the height of their popularity during the Communist era. It is also used to make rosé and sometimes blended with their main white variety, rkatsiteli, to make their semi-sweet Alazani wines. During the Soviet era, saperavi spread to several other communist countries, such as Moldova, but was virtually unheard of in the rest of the world. More recently, it immigrated to the Finger Lakes region of New York and then to Australia. The Georgians were represented thanks to local importers tamada.com.au and vinous.com.au, which import Tbilvino Wines and Pheasant’s Tears Wines respectively. We were therefore able to compare examples of Georgian saperavi to those from other cool/cold climate areas, as well as trying saperavi that had been made in qvervi. One of the main observations from this tasting is that, irrespective of where the variety is grown and whether it is vinified conventionally or in qvervi, the wines displayed a great deal of core commonality: the deep, dark colour; the fragrant beetroot-like aromatics; and the solid, central core of tightly structured flavour. The other main observation made is that there are two distinctive styles of saperavi: a cool/cold-climate style and a warm-climate style. Saperavi is renowned for its ability to cope with extremely cold conditions and therefore the cool/cold-climate wines are the norm and were, in the main, slightly lighter coloured, tighter and more restrained, with higher acidity and needing longer for the fruit to come to the fore. Whereas warmer climate saperavi is a much more recent phenomena that has only really arisen since the variety’s arrival in Australia. While these wines are much more open and opulent than their more restrained cool cousins, they share the same core inherent characteristics of huge colour, a steel rod (RSJ) backbone and masses of flavour. However, being from a warmer climate allows for more acid to be converted to sugar – they are more forward, less austere and ready to drink earlier than their cooler climate counterparts. It is somewhat similar to say, comparing Barossa shiraz to those of the cooler Adelaide Hills or Tasmania. The Tbilvino range of six saperavi starting with the 2013 rosé, which to start with wasn’t very impressive compared to Aussie rosés but after a couple of hours of breathing in the glass, it was fantastic, as the strawberry aromas and elegant flavours came to the fore. The three dry red Saperavi wines from Tbilvino each came from a different region in Georgia. They were the Tbilvino Napareuli 2013 Saperavi, which unfortunately was corked; the Tbilvino Mukuzani 2013 Saperavi, a lightish bodied (for saperavi), smooth, mellow wine that is ready to drink right now on its own; and the Tbilvino Kakheti 2013 Saperavi from the main/best known growing area in the country, was a very classy wine with attractive aromas. The latter had a smooth, rich body with a great depth of flavour and was not as acidic or tannic as most of the other wines in this tasting. This is a great example of how good Georgian saperavi can be equally enjoyable on its own or with delicious food. The other Georgian saperavi – both the Pheasant’s Tears 2013 Saperavi and the Vinoterra 2009 Saperavi – were made in qvervi rather than by conventional methods. These two wines were quite a contrast, with the Vinoterra being a sophisticated, elegant, smooth, medium-bodied in colour and palate wine, with a finer finish. While the Pheasant’s Tears was massively dark coloured, big-bodied with palate-coating, balanced flavours and a tight finish – an outstanding bigger style wine. Two amazingly different styles of wines both made in qvervi. Dr Konstantin Frank Wines – Their 2013 wine was relatively a bit lighter in colour (still quite deep), soft on the bouquet, with great depths of flavour and backbone – a great example of cool/cold-climate saperavi. Standing Stone Vineyard 2012, 2013 and 2014 Saperavi – The 2012 was as one expected from such a cold climate: tight, austere, acidic and dry, but with that big, steely backbone of fruit character and gorgeous flavours just waiting to break out and pounce on one’s palate. It simply needs quite a bit of time to complete its mission. Whereas the 2013 and 2014 were progressively a tad softer and more open than their predecessor. This change, whether due to warmer growing seasons or changing winemaking technique, makes the wines more approachable in their youth. All three are great food wines now and will continue to open up over time. McGregor Vineyards Black Russian Red 2007, 2008, 2010, 2011, 2012 and 2013 – This wine isn’t a straight saperavi but rather a blend of saperavi and sereksiya charni, which is the Russian name for the Romanian variety Băbească Neagră, (a tongue twister either way), that is, it is a saperavi blend. Wow, what a fantastic experience to be able to look at six vintages of the same wine from over the other side of the world. Starting with the 2013 and working backwards, one could see the progression as the wine matures, with the tannins softening off and making the wine smoother and less austere. Their potential longevity was verified by re-trying each wine several hours after the tasting, and in every case the wines had opened up considerably more and softened off, with the 2012 especially becoming absolutely sensational. Ballandean Estate 2015 Saperavi – Granite Belt. A big, flavourful, rich wine, very tight and needs plenty of time and food. Ridgemill 2014 The Csar Saperavi – Granite Belt. Slightly lighter-bodied but gorgeous, earthy beetroot aromas, well-structured with heaps of flavour and needing some time. King River 2014 Saperavi – King Valley. Dense colour, appealing beetroot aromas, rich flavours and also needs plenty of time. Ten Miles East 2015 Saperavi – Adelaide Hills. Almost black in colour, tightly structured with masses of flavour – a real keeper. Symphonia 2008 Saperavi – King Valley. At nine years old, it is very tight and needs more time. It still has purple hues and great flavour. One of the first Aussie saperavi and powering along! Each and every one of these wines was excellent, being really deep and dark in colour, dense, tightly packed with heaps of restrained flavour just waiting to burst onto the scene as the acids and tannins subside over time. These wines require either lots of patience or to be accompanied by big flavoured rich food. Alex Russell Wines 2015 and 2016 Alejandro – Murray Darling. What a difference a year’s maturation makes. The 2015 is starting to mellow and be approachable, whereas the 2016 is still very tight and a bit agro. Both will be excellent wines a bit further down the track as they evolve. Cirami Estate 2015 – Riverland. Light and bright (by comparison), smooth, ready to drink, with flavours of plums, cinnamon, spice and a hint of bitter chocolate. The extra warmth is reflected in lower acidity and richer riper fruit. It is a drink-now wine while your other saperavi are slowly mellowing. Lino Ramble 2016 Simon Says – McLaren Vale. Bright purple, big young aromas and so tight. It is too young now but will grow up nicely. Hugh Hamilton 2014 Oddball – McLaren Vale. Very deep in colour, rhubarb aromas with rich flavours. This will be an excellent wine in time as it softens off but patience is needed. Dell’uva 2013 and 2012 – Barossa. Supercharged! Almost black, rich, luscious, powerful, seamless, just needs a little time to soften off a bit more. Will soon become a classic, warmer climate style saperavi. Patritti Wines 2007 to 2015 – Barossa. Wow, what a vinous adventure, tasting every vintage that they have made and seeing the wines change as both the vines mature and their style evolves over time. The first two vintages, although good wines, were atypical of the style that they have since created, probably part of the process of coming to grips with the variety. Over the years, as the vines have matured, their own style has developed to the extent that the pre-release 2014 and 2015 vintages are amazing wines. They have masses of deep, dense colour that is almost black, attractive earthy, beetroot aromas and uber-tight, restrained flavours that tantalise the palate with what will be when these wines are mature enough to open up and truly blossom. I think they will be world-class wines easily outshining the 2011 vintage, which won a gold medal in the Royal Sydney Wine Show a few years ago. To sum up, saperavi is a little known, ancient yet innovative variety that produces sensational big wines with heaps of dark, dense colour, generally soft gentle aromatics and metric tonnes of flavour and tannins. In general, it is by no means a drink-now variety as the tonnes of tannins need time to soften off and allow the fruit to shine through. It is truly a keeper, as the occasional 50+ year old wines opened in Georgia and other former Soviet Bloc countries prove. 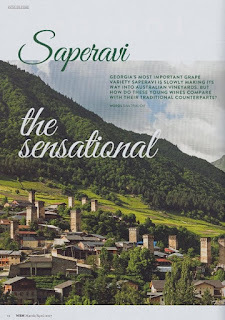 Saperavi makes lovely, big and highly desirable wines from warm as well as cold regions. Yes, the wines from these two climates are quite different in style, but the basic elements, structure and core flavours of the wines are consistently the same. 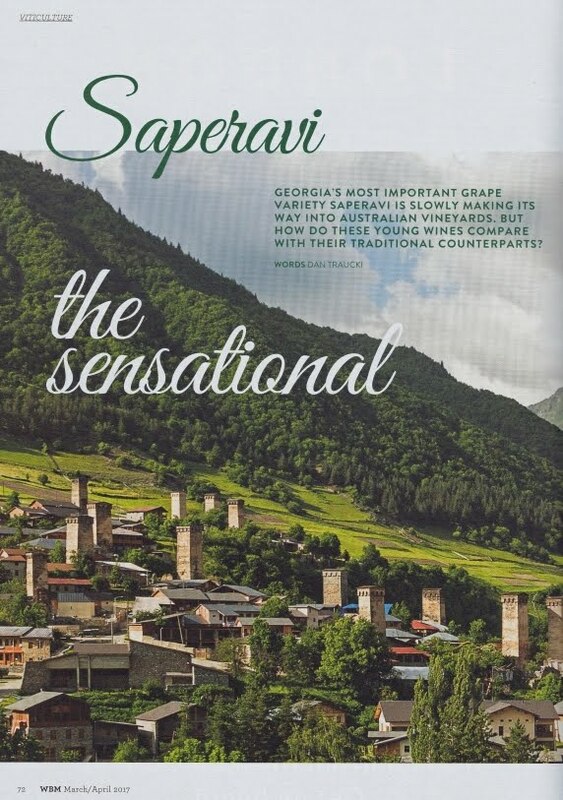 So, if you are looking for a big wine to enjoy with a big, rich meal or even to tuck away for a while in the cellar, please consider a saperavi the sensational, you won’t be disappointed by this wonderful, innovative grape variety.